Green senior Hailey Hammond (center) poses for a photo with coach Austin Gifford (left) and mother Aroma Gifford (right). 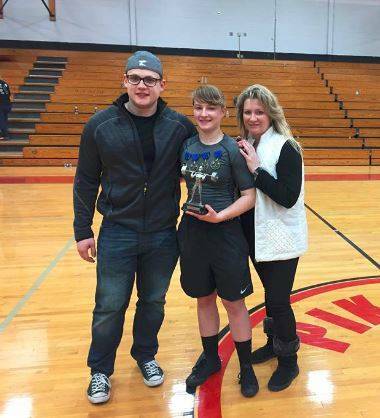 PIKETON – In her first ever powerlifting meet held at Piketon High School on Saturday, Green senior Hailey Hammond had quite a day. The Franklin Furnace native broke three records at the meet, won four competitions overall, and by the meet’s end, was awarded the Pound for Pound overall trophy between all girls that competed in the event. Hammond’s performance on Saturday wasn’t just record breaking, it was record shattering. She benched 145 lbs. which broke the record held by 35 lbs., she broke the squat record by 70 lbs. by squatting 345 lbs, along with deadlifting 325 lbs., breaking that record by 80 lbs. Some quick math says that she was able to shatter those three records by a combined 185 lbs., an outstanding accomplishment. As the event concluded, Hammond was award the Pound for Pound trophy with 815 lbs. total lifted during her first competition. Needless to say, after her first competition, Hammond can only continue to improve in her lifting capabilities by continuing to work on her craft.